Perrin Intake Components UNIVERSAL - Pann Auto Performance - San Diego largest aftermarket automotive performance parts - What do you drive? 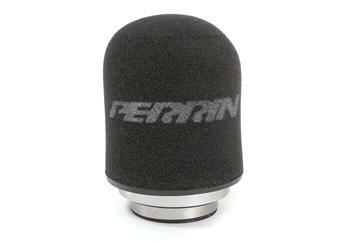 This is a direct replacement for most Subaru PERRIN Performance intakes systems including the Big MAF intakes. It will also work on any intake system which accepts a 3.125” filter. PERRIN Performance filters feature a unique two piece design allowing the user to remove the foam filter element for easy cleaning. Easily run the element under a faucet for cleaning and ring out by hand. Simply slip the foam sleeve back over the filter frame and your ready to go. Please check the Inlet Inside Diameter (I.D.) of the filter are replacing as there are variations of intake design. This filter has a 3.125” I.D. Inlet. Protect your filter and intake from the most extreme environments. The PERRIN Performance Pre-filter extends the time between servicing intervals reducing costs and increasing convenience. The Pre-filter is constructed with a proprietary polyester mesh with uniform micron openings. The mesh is UV resistant, and can withstand heat up to 450 degrees. The material is puncture resistant and has elasticity characteristics allowing the threads to return to the original position in the event the threads have been impacted or shifted.